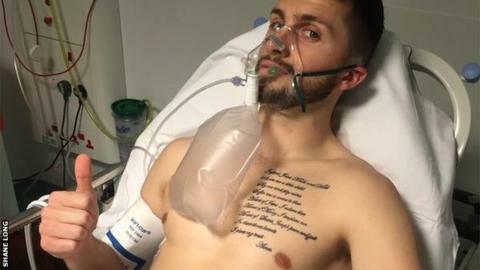 Southampton striker Shane Long is likely to be out of action for several weeks after suffering a suspected broken rib in his side's 3-2 defeat by Crystal Palace on Saturday. The 28-year-old was sent on as a 59th-minute substitute at St Mary's, but had to go off again 15 minutes later. "The doctor says maybe its a fracture of one of his ribs," Saints boss Ronald Koeman told BBC Radio Solent. "We have to wait but we will miss him for sure in the next few weeks." The Republic of Ireland international, who has scored four goals since signing from Hull in the summer, suffered the injury after a collision with Palace defender Joel Ward. And it is set to stretch Southampton's resources further, with Morgan Schneiderlin, Victor Wanyama and Toby Alderweldreid currently sidelined, and Sadio Mane away with Senegal at the Africa Cup of Nations. Koeman said last week that he was unlikely to add to his squad in the remainder of the January transfer window, following Eljero Elia's arrival on loan from Werder Bremen, with the injury absentees expected to return to action in the near future, and defender Maya Yoshida expected back at the club on Tuesday following Japan's Asian Cup exit last week. Meanwhile, the Dutchman blamed an uncharacteristically poor defensive display for their defeat at the hands of Alan Pardew's south London side. "Palace played well, and credit to them but normally we don't make those mistakes - you cant play like that," said Koeman. "Normally defence is our strength. We are normally so compact but we left so much space for the counter-attack it was incredible. "If you give them space and don't have the teamwork in defending then it's difficult to have clean sheets." Koeman admitted the defeat was particularly frustrating, given the shock exits of Chelsea and Manchester City. "If you go on in the FA Cup and teams like Chelsea and Manchester City are out, the possibility to reach the final is bigger," he added.